Computing technology has never been cheaper. You can buy a powerful off-contract smartphone (Moto G) for $179, an amazing tablet (the Nexus 7) for $229, and Apple’s latest operating system, OS X Mavericks, was released free of charge. Of course, cheap technology has always been available, but cheap technology has never been this good. 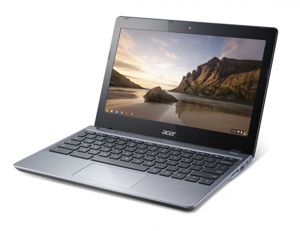 That’s the theme behind Acer’s new $249 C720 Chromebook – cheap, but good. Like other Chromebooks, the 11.6-inch C720 forgoes the ludicrously expensive Windows 8 in favor of the less expensive Google Chrome OS. There’s no CD drive built in, and you only get 16GB of SSD storage. Of course, all this is intentional, meant to provide the most basic good laptop experience at the lowest price possible. And indeed, there is plenty of good in the C720. It comes with an HD webcam, WiFi, speakers, USB 2.0 and 3.0 ports, HDMI output, and 2GB of RAM. If the blazing fast solid-state drive is too small for you – and PS, this Chromebook boots in just 7 seconds – Google is bundling the Acer C720 with 100GB of free cloud storage for two years. Ultimately, a Chromebook like this is perfect tablet alternative for someone looking to handle the Internet basics or travel. You won’t be able to play heavy-duty PC games (though light-weight games like Angry Birds are available), and you’ll likely find it difficult to print documents from it. But if you want an insanely inexpensive computer with a built-in keyboard and 8.5-hour battery, this Chromebook is worth checking out. The Acer C720 Chromebook is available starting today at Best Buy starting at $199. To read up more on the C720, visit Acer’s website. To learn more about Chromebooks in general, check out Suzanne’s primer on the technology. Editor's Note: Story changed to reflect that Best Buy now has the C720 for $199. Chromebooks make sense for users that spend most of their time on the web, as a 2nd family computer, in schools, etc. If you want to do some work from home, and your company uses Windows applications (like MS Office), you can use a product like Ericom AccessNow, an HTML5 RDP solution that enables Chromebook users to connect to Terminal Servers and/or VDI virtual desktops, and run Windows applications or desktops in a browser tab. There’s nothing to install on the Chromebook - just connect to a URL and enter your login name and password.